CAMP SEC. RUPERTO K. KANGLEON, Palo, Leyte – The Police Regional Office 8 (PRO8) announced that four persons have been arrested for violating the election gun ban 10 days since its implementation on Sunday, January 13. PRO8 Regional Director Police Chief Superintendent Elmer Ragadio Soria informed that two of the violators were arrested in checkpoint operations in Samar while one was arrested as a result of implementation of search warrant. Another violator was a suspect in a murder incident wherein 2 firearms were confiscated after a lawful arrest. Soria added that since the start of the gun ban, they have confiscated 10 assorted firearms while 11 other firearms were deposited by their owners in various police stations regionwide pending the processing for renewal of their respective licenses. “We are appealing for the support and cooperation of the public. The strict implementation of the gun ban as shown by our intensified checkpoint operations and implementation of search warrants forms part of our commitment in securing a secure and fair midterm elections,” Soria said. In Samar, two men were separately arrested in checkpoint operations for violating the gun ban in Sta. Rita and Calbayog City. Soria identified the violators as Enrico Espino y Cajepe, 55, farmer, who was arrested in the morning of January 17 in a checkpoint established by the police along the national highway in Brgy. Tominamos, Sta. Rita, Samar while carrying a caliber .22 air rifle bearing serial number 98221 with 18 pellets. The other suspect, identified as Bonifacio Dalion y Rosana, 41, businessman, was arrested last January 16 in a checkpoint at Brgy Migara, Calbayog City by a police team led by Police Superintendent Elmer B. Cinco, Chief of Police. Dalion was in possession of one unit caliber .45 Colt pistol with serial number 374821 and 3 magazines loaded with 7 ammunitions each. Also, in Calbayog City, implementation of a search warrant issued by Executive Judge Cresente Maraya of Regional Trial Court Branch 11 in Calubian, Leyte last January 17 at the house of Mark Anthony Giray y Atiga, 31, Barangay Kagawad of Brgy Malaga, Tinambacan District, resulted in the confiscation of 3 caliber .45 pistols marked Armscor, Itchaca and Colt MK IV and a Armscor model 30 shotgun, including several magazines, ammunitions and gun paraphernalia. Meanwhile, in Brgy. Naga, Oras, Eastern Samar last January 20, an implementation of search warrant issued by Judge Juliana White of Regional Trial Court Branch 5 in Oras, Eastern Samar at the residence of Roger Moscare, 32, and Ronald Lumuntad, 30, both laborers resulted in the confiscation of homemade PVC cannon locally known as “boga”. However, the subjects were not around during the search. On January 21, personnel from San Juanico Bridge Leyte Side Detachment of the 8th Regional Public Safety Battalion responded to a call for police assistance at Brgy Tinaogan, Basey, Samar wherein upon arriving at the scene, Brgy Chairman Mariano Lar turned-over one .38 caliber revolver marked Squires Bingham with serial number 955307 with no ammunition allegedly confiscated from a certain Jhun Calina, also from said place. Calinao is now the subject of manhunt operations by the PNP. Soria added that cases for violations of RA 8294 in relation to Comelec Resolution 9561-A were filed by the police against the suspects apart from the charges for the other crimes they committed. CATBALOGAN CITY – The Department of Health-Samar warns public against cases of Chikungunya virus infection. The warning was issued in the province of Samar after 28 cases of fever with rashes and joint pains from Barangay Guintarcan were reported by the Municipal Health Officer of Rural Health Unit (RHU) Villareal, Samar in December 10-27, 2012. Ten cases or 36% were confirmed to have Chikungunya infection through IgM ELISA testing by the Research Institute of Tropical Medicine (RITM). Another 235 cases with similar symptoms were reported in Barangay Banquil of the same town which will be investigated further by the local health authorities. Chikungunya fever is a viral disease transmitted to humans by the bite of infected mosquitoes (Aedes Aegypti). Symptoms appear on average three to seven days after being bitten by an infected mosquito. The virus causes high fever and severe joint pain that suddenly. It can also cause headache, muscle pain and rash. Acute Chikungunya fever typically lasts a few days to a few weeks; some patients have prolonged fatigue lasting several weeks. Chikungunya virus infection (whether clinically apparent or silent) is thought to confer life-long immunity. According to Dr. Antonio Tirazona, Chikungunya is not usually fatal. Co-circulation of dengue fever in many areas may mean that Chikungunya fever cases are sometimes clinically misdiagnosed as dengue infections, therefore the incidence of Chikungunya fever could be much higher than what has been previously reported, Tirazona added. There is no vaccine or specific antiviral treatment currently available for Chikungunya fever. Treatment is symptomatic and can include rest, fluids, and medicines to relieve symptoms of fever and aching such as ibuprofen, naproxen, acetaminophen, or paracetamol. Aspirin should be avoided. The doctor said that infected persons should be protected from further mosquito exposure during the first few days of illness so they can not contribute to the transmission cycle. Tirazona suggested to the infected persons to stay indoors in areas with screens or under a mosquito net. Same as in dengue control measures, the public is advised to practice the 4-S campaign, which includes searching and destroying possible breeding grounds of the mosquito vector; Self-protection by wearing long sleeve shirts and pants to prevent mosquito bites; seeking health professionals for a fever that lasts two days or more, and saying no to indiscriminate fogging. MANILA – Vice President Jejomar C. Binay today said the decision of the Philippines to file a case against China before a United Nations arbitration body is an expression of President Aquino’s commitment to protect Philippine sovereignty. He also urged China to recognize the jurisdiction of the UN body, saying this would help advance peace and harmony in the ASEAN region. “The filing of the case before the UN tribunal is an expression of our desire to resolve the dispute with China within the framework of international law,” Binay said. “President Aquino is committed to protect our sovereignty and is likewise committed to resolving the dispute with China in a peaceful manner. I am hopeful that China, in the interest of greater peace and harmony in the region, would recognize the jurisdiction of the UN arbitration tribunal in accordance with international law,” he added. “A peaceful resolution, under the purview of international law, would be in the best interest of both countries and the ASEAN region,” he said. The United Nationalist Alliance (UNA), which is chaired by the Vice President, likewise expressed its full support for the administration’s action. “President Aquino has consistently defended our sovereignty against provocative moves by China,” UNA Secretary General Toby Tiangco said. “The incursions by China into Philippine territory and its claims on a substantial part of the West Philippine Sea were in clear violation of international law and our sovereignty. The decision to raise the matter before the UN arbitration tribunal is our way of telling China that we are determined to protect our sovereignty in a peaceful way,” he said. The Philippines on Tuesday invoked the United Nations Convention on the Law of the Sea (UNCLOS) to bring China before a UN arbitration tribunal over its claim to a large portion of the West Philippine Sea. QUEZON CITY – Detained poet Ericson Acosta today welcomed DOJ Sec. Leila de Lima’s directive for the “immediate disposition” of the petition for review of his case. The Justice chief promised immediate action in response to Acosta’s personal letter inviting her to a dialogue. Until last Friday, Acosta has been detained at the Calbayog Sub-Provincial Jail while his petition for review at the DOJ has been pending for more than a year. Acosta was recently granted temporary release by the Gandara RTC in Samar on humanitarian grounds. He is currently confined at the National Kidney Transplant Institute (NKTI) in Quezon City while undergoing tests and treatment for a kidney ailment. "I welcome Sec. Leila de Lima's directive. The resolution of my petition for review is awaited not only by myself but by my family, friends and supporters all over the world. My invitation to a dialogue with her still stands," Acosta said. He also thanked his supporters for their alertness amid attempts by his BJMP guards to employ irrational and repressive measures during his confinement at the NKTI. Yesterday, his BJMP guards threatened to handcuff him to his bed but were stopped by quick action from his supporters and legal counsels. According to the Free Ericson Acosta Campaign, the BJMP’s failure to further repress Acosta and terrorize visitors was an “initial victory”. “Still, the BJMP remains overzealous in restricting his privacy and rights. Visitors confirmed that the armed guards are the same ones that guarded Morong 43. These are not mere guards but professional bullies, our vigilance must be increased tenfold,” the group said. Yesterday, at 6:00 in the afternoon, a certain Dr. Col. Mundin who introduced himself as a doctor of the BJMP unceremoniously barged into Acosta’s room and started asking about his medical condition. He was accompanied by two BJMP guards. He then showed a document and informed Acosta and his companions that other members of the “BJMP Health Team” are set to “do a series of tests” on him. Mundin again attempted to enter Acosta’s room today but was stopped by NKTI security. “The BJMP has no business meddling into Acosta’s medical procedures. We expect the DOJ to put the BJMP in its place. The added stress and obvious ploys to harass him will only aggravate Acosta’s medical condition,” the FEAC said. The FEAC, led by various artists, cultural workers and supporters, will stage a picket-rally at the DOJ tomorrow to call for the dismissal of Acosta’s case. 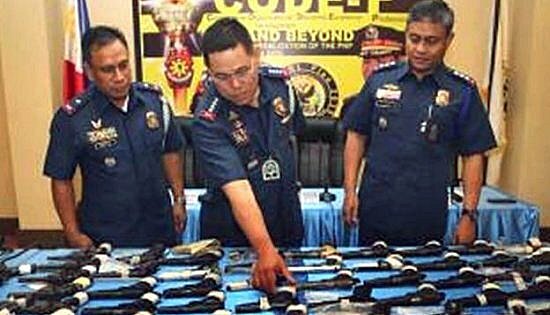 Police Director General Alan La Madrid Purisima (center), PNP Chief, inspecting the confiscated loose firearms by PRO8 during his visit last Saturday. Looking on are Police Chief Superintendent Elmer R Soria, PRO8 Regional Director (left) and Police Senior Superintendent Edgar O. Basbas, Deputy Regional Director for Administration (right). CAMP RUPERTO K. KANGLEON, Palo, Leyte – Despite the surrender of 19 members of private armed groups (PAGs) operating in Samar province last weekend including one of its leader, the Police Regional Office 8 (PRO8) will continue the crackdown against remaining PAG members who are still at large, especially those with existing arrest warrants. “While the surrenderees committed themselves to help ensure the peaceful conduct of the elections, they will be under close monitoring to make sure they will not be utilized by individuals to advance their political interests,” Police Chief Superintendent Elmer Ragadio Soria, PRO8 director said. Soria expressed confidence they would be able to “cleanse” the province of the remnants of PAGs and other potential sources of poll violence ahead of election day. He added that PAG members who did not turn themselves in to police authorities despite efforts in negotiation for their surrender by his office would suffer the full force of the law and will be arrested if they have existing warrants of arrests to prevent the possibility that they could be used to sow violence in the forthcoming midterm elections. PAG refers to a group of two or more persons being utilized by a certain politician or individual to sow fear or intimidation, possessing legal or illegal firearms to advance political interest. Samar province is included in the list of 15 “priority areas” by the Department of Interior and Local Government (DILG) with the two PAGs operating in the province’ first district that includes the city of Calbayog and 9 other municipalities. To recall, 19 PAG members surrendered on Saturday morning to PRO8 that was personally witnessed by Police Director General Alan La Madrid Purisima, Chief of the Philippine National Police. Of the 19 surrenderees, 14 belong to Montealto group including its alleged leader, Calbayog City Councilor Jonas Montealto, while 5 belong to the Moloboco group. The PAGs also turned-in assorted firearms, five from Montealto and four from the Moloboco group. At least 17 members from the Montealto group while 12 from Moloboco group are still the subject of police operations by the Regional Special Operations Task Group (RSOTG-Samar). In December last year, two Montealto and one Moloboco PAG members voluntarily surrendered to RSOTG while PAG leader Julito Aragon y Cachero alias Nonoy, listed as the Number One Most Wanted Person in Samar province and wanted for two counts of murder was killed in a shoot-out with police authorities on December 23, 2012 in the hinterlands of Brgy. Peñaplata, Gandara, Samar. “Our main goal in this campaign is to make sure that it is really the sovereign will of the people that are reflected in the election results and not due to fear, violence and intimidation,” Soria further averred. The police official also presented to the Chief PNP the RSOTG accomplishments in the campaign against loose firearms with 35 assorted long and short arms and 52 improvised PVC cannons locally known as “boga” accounted in various police operations. A total of 101 assorted firearms also were deposited for safekeeping with RSOTG in relation to the “Bilang Boga” campaign of PRO8 in Samar. PASAY CITY – Senate minority leader Alan Peter Cayetano pushed for an independent auditing firm to step in the Commission on Audit (COA) stead in scrutinizing the liquidation and certification of funds in the Senate. “If we have a private auditing firm do the accounting there will be no shadow of doubt. COA’s budget also comes from us so others might have a perception that they are beholden to us. An independent firm won’t risk ruining their name to appease a senator,” he said. The senator gave this suggestion in light of Senate President Juan Ponce Enrile’s distribution of P1.6 million to 18 senators and P250,000 to the remaining four including the minority leader under the guise of additional maintenance and other operating expenses (MOOE) funds. The action has opened the question on whether or not such a disbursement from the Senate President’s discretionary funds is legal. “It may be from his office’s savings. But when you have savings from your office, you have to return it. You can’t give it away,” he said. He explained that this was the reason why he followed Sen. Koko Pimentel’s lead and had his finance officer embargo the check for P250,000. He also noted that this check, while printed on an official Senate check, had no accompanying documents unlike the additional MOOE of P1.3 million given to senators prior to this incident. “The irony here is that the P1.3 million might be more legal than the P250,000 simply because it has accompanying documentation,” he said. The minority leader pointed out that this question is hard to answer given that while COA chairperson Grace Pulido-Tan has said that realignment is legal, the fact still remains that COA has dealt with no other similar cases. “It’s true that you can realign. But you cannot use the savings of your office as any kind of gift. You can realign it then give it for a specific public purpose. You have to certify it for that purpose with the accompanying documents. What Sen. Enrile did is the first time I’ve ever encountered such a thing done,” he said. 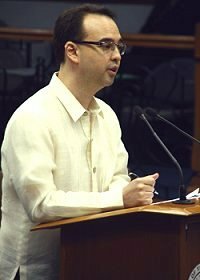 Cayetano stressed that the only way to end this debate quickly and effectively is to have a private auditing firm step in and open the Senate books in the same way they’ve asked the oil companies, former Chief Justice Corona and General Garcia to do in past Senate investigations. “We have so many vital pieces of legislation left to contend with. So my suggestion is we get a private auditing firm, tell the finance officer to open the books and let the public see through the media what this audit yields,” he said. “We have asked so many people we’ve investigated to open their books and accounts. It’s time we lead by example and do the same,” he added. QUEZON CITY – Environmentalist and militants trooped to the US Embassy to denounce the recent grounding of USS Guardian, a US Navy minesweeper, in world heritage site and marine biodiversity-rich Tubbataha Reef National Park. “At this moment USS Guardian is stuck atop Tubbataha Reef and continues to wreck our national treasure. The US officials until now offer no clear explanation as to why their ship trespassed into the marine sanctuary. No apology or even an acknowledgement of the violation was done,” says Clemente Bautista, Kalikasan PNE national coordinator. According to US Pacific Fleet, the USS Guardian had just completed a port call in Subic Bay and was en route to Indonesia and then on to Timor Leste to participate in a military exercise when the grounding occurred. The US Navy attributes the error to a faulty navigation chart. “Blaming old digital navigation chart the reason for grounding is a lame excuse, the intruders are clearly lying. The US ship is equipped with state of the art navigation technology and weaponry,” Bautista points out. The US Navy has pulled out and took custody of 72 out of 79 crew of the USS Guardian. Commanding and executive officers remain on the ship. “The Philippine government should assert its jurisdiction and authority over our territorial waters. Like what we did with the Chinese poachers who entered the Tubbataha Reef area, the US Guardian officials and crew should be arrested and apprehended. The Philippine government should be the one doing the direct investigation and have custody over the violators,” Bautista explains. “Instead to be prudent and assertive, the Aquino government and the Armed Forces of the Philippines (AFP) just accepted the excuses and allowed US military forces to get scotch free like in their previous violations such as the toxic pollution in Subic Bay and US drone in Masbate. There is prima facie evidence that the US deliberately violated our laws,” Bautista states. Angeline Songco, Tubbataha National Park Management officer, said that the US Navy entered the reserve without a permit, damaged the protected corals, did not coordinate with the government officials, and prevented the park management to immediately investigate the incident. “The Philippine government, which up to this day have not filed any formal protest or complaint against the US Navy, is showing how spineless they are before the US. We expect that the Aquino government again to defend the US military forces by invoking the power of the Visiting Forces Agreement (VFA),” adds Bautista. “If VFA continue to be implemented, we expect these kind of violations to proliferate and persist, affecting our people and environment. Legal actions should be filed against the US Navy and VFA. If we want to protect our marine biodiversity and environment, we must work for the abrogation of VFA,” Bautista ends.